The flagship model of the new Slim d'Hermes line, the Perpetual Calendar is equipped with a refined Vaucher movement and a calendar module designed by noted movement designer Jean-Marc Wiederrecht. Introduced at Baselworld 2015, the Slim d’Hermes has a distinctive look despite being clean and simple. The base model in the collection is the strikingly original automatic, but launched alongside was the Slim d’Hermes Perpetual Calendar, one of the few such complications offered by Hermes. 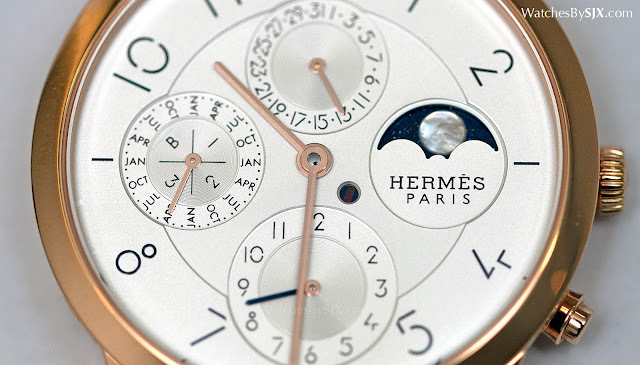 The Slim d’Hermes Perpetual Calendar has the same polished appearance as its simpler brethren. The sum of its parts are far greater than the individual design elements: a beautiful custom font created by graphic designer Philippe Apeloig, polished and frosted hands, and angled lugs that echo the wire lugs on early wristwatches. Unlike the elegantly plain automatic model, the perpetual calendar has a subtle touch of extravagance on the dial. The moon phase is shown with a disc of sparking aventurine, a dark blue quartz with mineral inclusions that resembles a starry night sky. And the moon is a small inlay of mother of pearl. 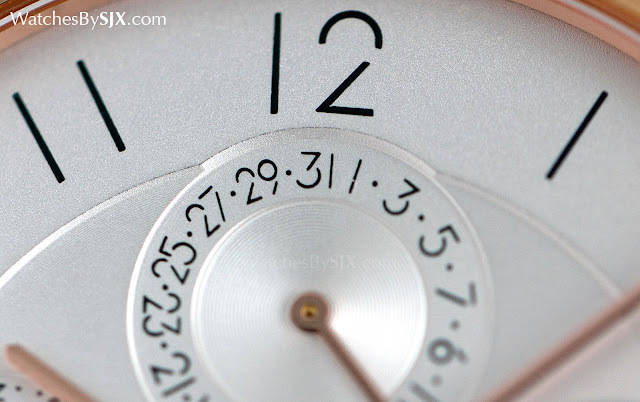 Despite being having a more complex dial, the aesthetic of the perpetual calendar remains pure and uncluttered. The font used is legible and are enough, with all the calendar indications laid out sensibly. 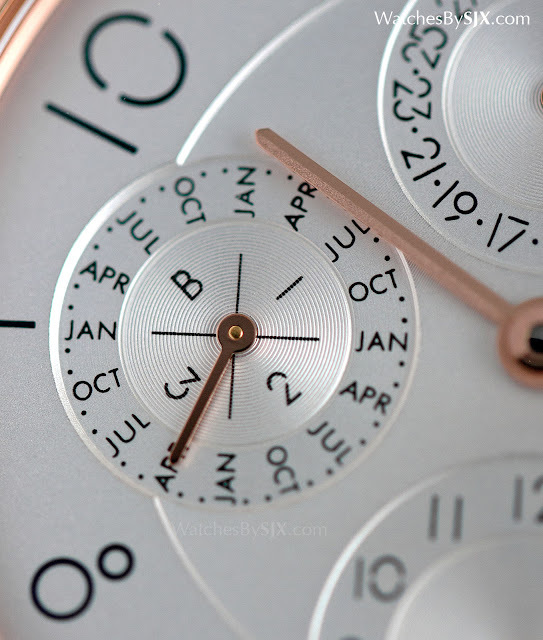 Going clockwise at 12 o’clock, the sub-dials show the date, moon phase, second time zone and the month along with the leap year at nine o’clock. The second time zone is set in one hour increments via the button at four o’clock. The limited functionality of the second time zone is the one weakness of this watch. The tiny round aperture in between the moon phase and second time zone is the day and night indicator, which also doubles as a safety mechanism for adjusting the calendar. Most perpetual calendars cannot be set during the period which the calendar display changes. So the day and night indicator shows white for day time and black for nighttime, but in the hours leading up to and just after midnight it shows red, meaning that the calendar cannot be adjusted. The perpetual calendar module was designed by Jean-Marc Wiederrecht, co-founder of movement developer Agenhor. Wiederrecht is one of the best known technical specialists in the industry, best known for his work with MB&F and Van Cleef & Arpels. 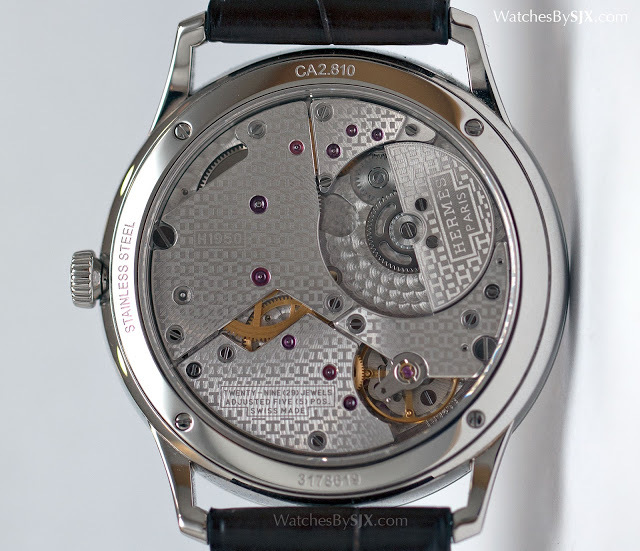 His calendar module is just 1.4mm high, leaving the entire movement just 4mm – slim for this complication. At 39.5mm in diameter, the Slim d’Hermes Perpetual Calendar is the same size as the automatic, though slightly thicker to accommodate the calendar mechanism. The base movement is the H1950, an automatic movement developed by Vaucher, a movement manufacturer of which Hermes owns a quarter stake. 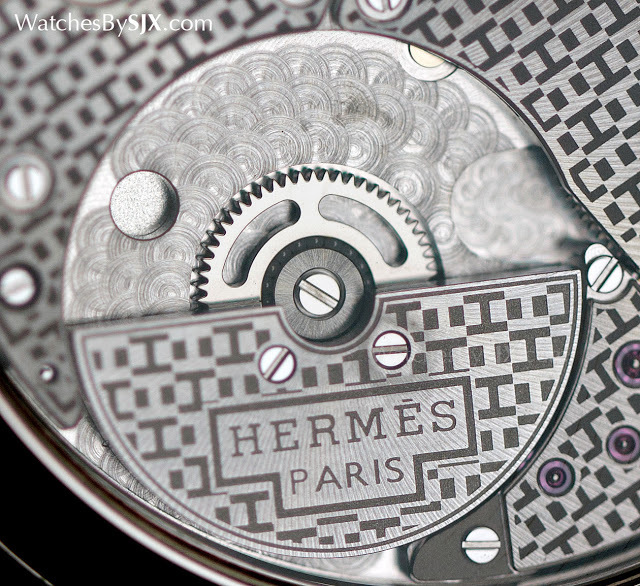 It’s wide but extra-thin, with a micro-rotor and decorated with the repeating embossed “H” characteristic of Hermes’ “manufacture” movements. 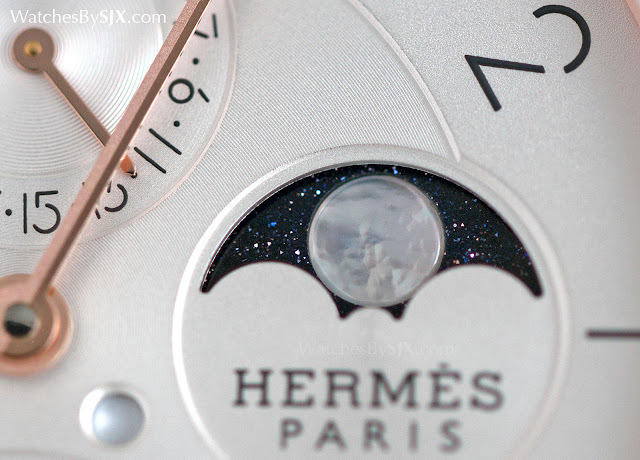 Though Hermes does not yet have the legitimacy of traditional watch or movement makers like Jaeger-LeCoultre or Zenith, timepieces like the Slim d’Hermes are every bit as accomplished as the products from established brands. 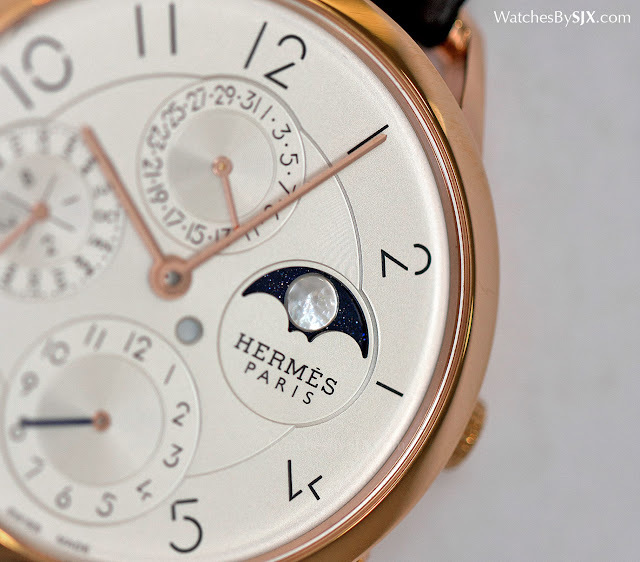 Hermes, along with its fellow Parisian luxury house Louis Vuitton, are slowly but surely making their way up in watchmaking. 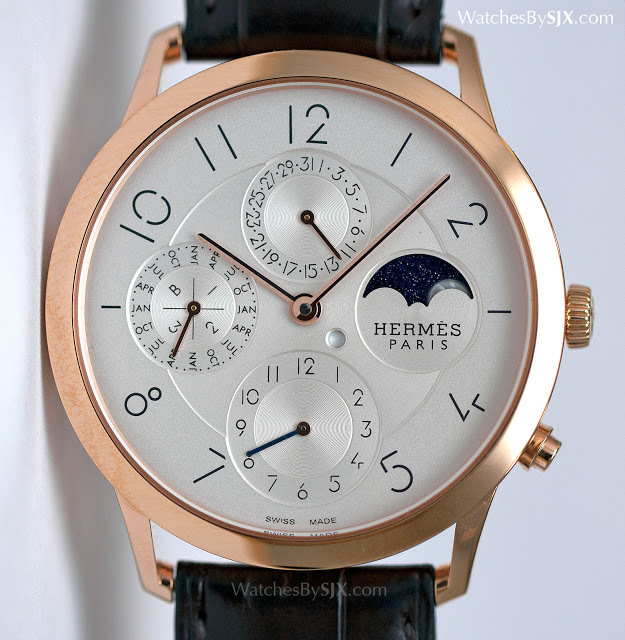 The Slim d’Hermes Perpetual Calendar is available only in rose gold, with a price of US$38,900 or S$55,180. They will arrive in stores in June or July 2015.